A marvellous crop of new tunics. Guy Laroche Vogue 1268 is a dress. But I see it made shorter as a tunic. 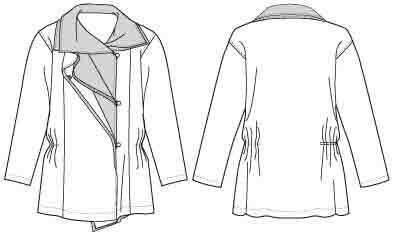 Or with the fronts separated as a light jacket. Issey Miyake tunic Vogue 1278 has a good collar for drawing attention to your face. Much more to it than Vogue’s photos show. That outer layer is sheer, an interesting idea. And I do love Lynn Mizono’s shirt-jackets. Here’s Vogue 1274. Several options for cozy warmth. Two of them are hidden in coat patterns. Vogue 8775 is good as I like a snuggle-up collar. Another is a hoodie by Sandra Betzina, Vogue 1276. Marcy Tilton’s Vogue 8779 jacket goes with the new oversized styles I”m thinking of writing a post on. Short jackets aren’t good on me, I would probably make this thigh length. Vogue 8780 has a upper cascade front and a longer back with more shaping than usual. A combination that’s right for me. Though for me an open front jacket is more a warm-weather style. This Vogue 8778 picture collar top is good for drawing attention to your face, but I wouldn’t find it comfortable to wear a thick coat over. And a cascade front vest with interesting back, Vogue 8777. But I wear a vest in winter for warmth, so need one that closes up to the neck. I may take another look at these in spring. 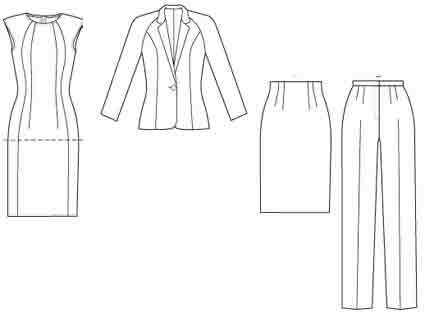 Relating these new patterns to Nancy Nix-Rice’s wardrobe plan : if your core wardrobe items are like Nancy’s examples (shell top, jacket, skirt, pants), there’s an elegant raglan sleeve fitted wardrobe pattern for you : Vogue 8781 with a shell/ dress, notched collar jacket, skirt and pants. 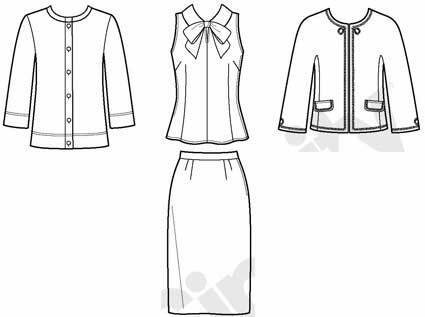 And if your core items are (top, skirt, dress, jacket) there are plenty of attractive modern dresses for you, and a couple of vintage dresses – one with jacket. But I rarely wear dresses myself. My personal core items are (shirt, tunic, vest, casual jacket, pants – with many sweater knits). There are some very slim pant patterns here. Not good on my legs. 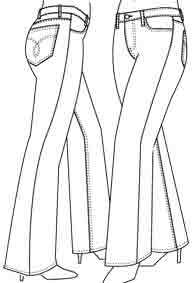 I always wear slightly tapered classic pants, like the ones in the wardrobe pattern. There is a new 5-pocket jeans pattern with both slim and straight legs, Vogue 8774. If I was going to pick a skirt it would be like this Vogue 8773 slim gored skirt with 2 lengths, 2 slit positions. 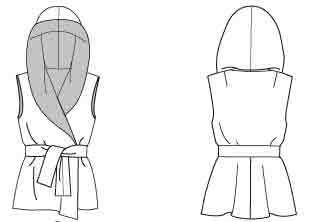 I would lower the raised waist, or I’d look as if I have no upper body, but long waisted people will love it unchanged. 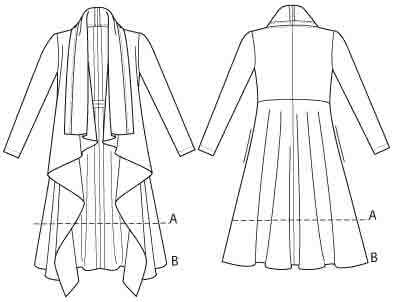 Replace the slits with pleats to make it like Nancy’s skirt examples. Of course this isn’t all of the new Vogue patterns, just my favourites. This batch includes some lovely party dresses. The Japanese call a dress a “one-piece”. But many wardrobe planners suggest a two-piece dress, as it adds more options. Look at these pieces from Butterick 3037. In a solid light wool or linen, they might be called a suit. In a pretty print, a dress. 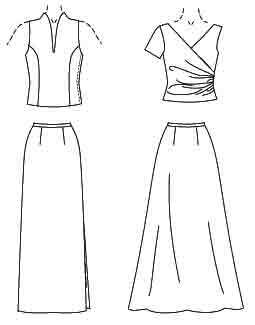 The print top with the linen skirt would be separates. I don’t think it’s helpful to worry about the words. Just think whether a top and bottom made from the same fabric, but too light and unstructured to be called a suit, would be useful in your wardrobe. And what pattern to use ? 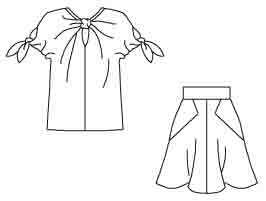 Of course you could just make your favourite blouse/ top with a simple skirt in the same fabric. But what about specific patterns for 2-piece dresses ? Here are some pointers. Butterick 3037 in full has a good range of choices. 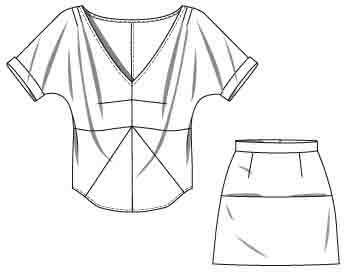 A top with 2 necklines and 3 sleeve lengths. 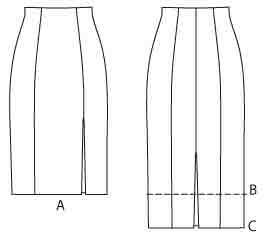 Straight and A-line skirts in 3 lengths. There are few two-piece patterns in the dress sections of the catalogues. The best source is wardrobe patterns. 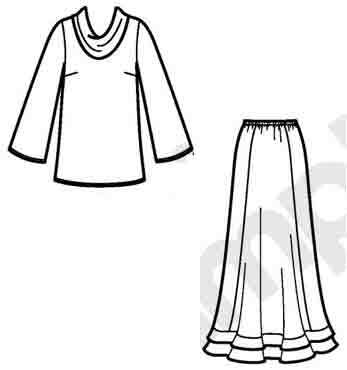 Many contain a top and skirt that can be made in the same fabric. 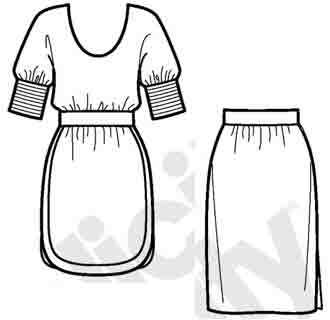 Not all, often the top is knit and the skirt woven. I’m not listing these patterns because there are so many, especially at Simplicity and New Look. Here’s one example, Butterick 5147. Tuck that top into a big New Look skirt for a vintage 50s effect. 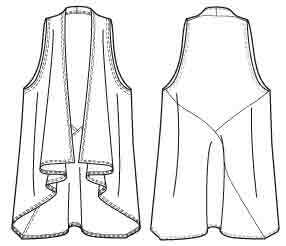 The trendy version of a two-piece dress is a tunic top over a short skirt. Here are some examples. McCall’s 6288 by Rebecca Turbow. 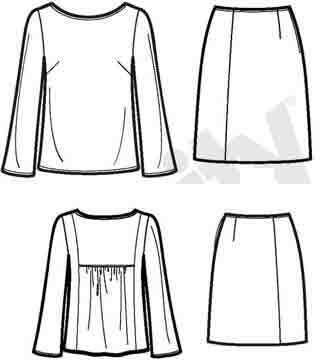 Interesting, there are some patterns which include a top and skirt that the designer wants made in different fabrics. They are in the ‘separates’ sections of the catalogues. Try the two-piece approach for other personal styles as well. It may be easier to combine favourite blouse and skirt patterns. If you like ruffles and wraps, how about Kwik Sew 3474 for example, with a mock wrap skirt. A casual person might prefer a tunic over a longer skirt in a knit fabric. Simplicity 3568 perhaps. For lovers of the arty oversized : here’s a wide top combined with a long handkerchief skirt. I used to think two-piece dresses are dowdy. But now realise I was looking in the wrong direction. This is just a sample of the interesting possibilities if you look beyond the dress sections of the catalogues. Check the separates. 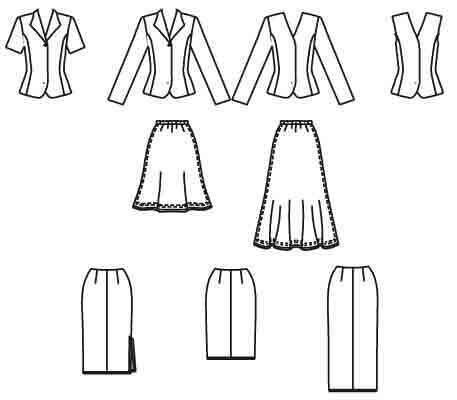 Or combine blouse and skirt patterns. Two-piece dresses can also be good for someone like me, very different sizes above and below the waist. Easier to make two different size items than to try to join them together at the waist ! Judith Rasband has whole DVD, Look Changers, on the different ways you can wear a 2-piece dress. The particular styles may be dated, but the general styling ideas apply in any decade. Doesn’t matter whether you call the two pieces a dress or separates made from the same fabric. Two items made from the same fabric have a stronger visual effect than the same two items made in different fabrics. Is that effect an option that you want to have available from your clothes ? If so, a top and skirt in the same fabric are garments you’ll want to have. Were you bowed down by all the neutrals that Nancy Nix-Rice started her optimum wardrobe plan with ? (previous post on the neutral core). I wear mainly neutrals so was happy with it all. But here at last, something for people who love colour and print. Nancy adds 4 more items, and shows how to integrate them with your basic Cores. Nancy next adds two tops in colour, both in the same or a closely similar accent colour. Under-layer – wide strap camisole. Over-layer – long sleeved unlined blazer jacket. Surprisingly difficult to find a wide strapped camisole pattern. Here’s Kwik Sew 2498. Would you like a change of style for your over-layer ? Nancy Nix-Rice’s scheme uses over-layers with a closable front opening. Buttons or zip. So the garment can be worn alone for another look. The popular cardigan jacket styles with a continuous neckband or a cascade collar can only be closed with a belt, so won’t give you the number of alternative looks Nancy is going for. 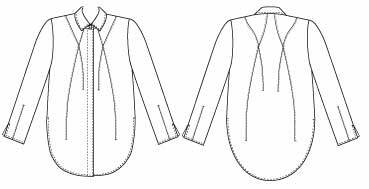 You could use the long sleeved version of the Butterick blazer pattern I mentioned before. If you’re not a blazer person, Nancy (not Nancy Nix-Rice !) in a comment suggested Burda 8503. 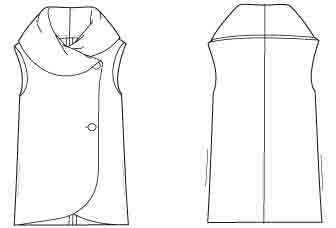 A good possibility with several necklines, sleeves, pockets – could be made in both blouse and jacket fabrics. What accent colour are you going for ? Choose a colour that makes you feel good. A colour from your eyes will make them sparkle. Finally, Nancy Nix-Rice adds a two-piece dress. Two pieces so they can be worn separately to give other combinations. In a print that combines your three colours : darker and lighter neutrals and accent. Nancy’s choice for top is a sleeveless shell with bow neckline. 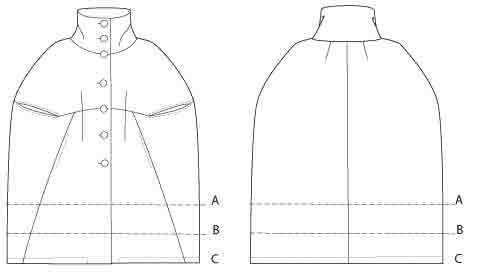 A couple of bow collar blouse patterns in the new patterns for this autumn. Here’s Simplicity 2151. Make sure the bow works with the necklines of your over-layers. Nancy uses a ‘slim’ skirt, though not tight. 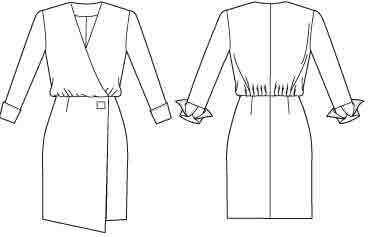 I have a post planned on two-piece dress patterns. Though the challenge is not finding the pattern but finding a print in the right 3 colours and your favourite print style! Nancy has good previous lessons on colour neutrals, contrast and prints. She has added excellent advice on choosing prints and accessories according to your facial proportions and facial structure (angles or curves). So that completes your basic 12 wardrobe items. Which Nancy makes into 95 different outfits. 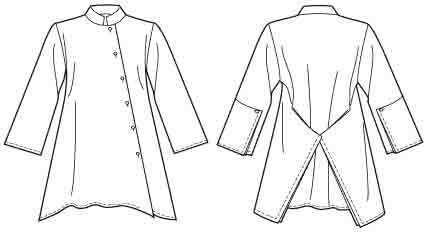 – woven jacket with short or long sleeves. – woven skirt and pants. Do you like variety ? Would you prefer similar or different ? I have some comments on possible co-ordinated pattern sources and personal style, but these posts are getting so long I’ve separated that section off for later. Meanwhile, Nancy does give us a lot to think about. . .